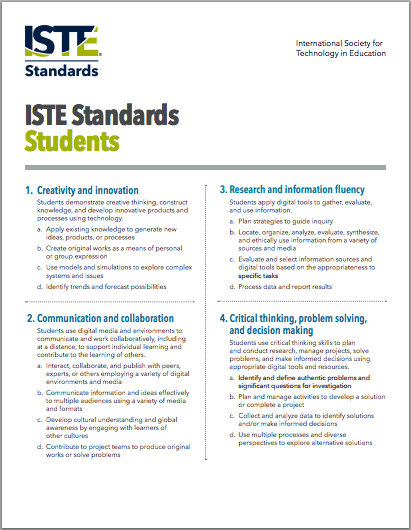 Here is a short two pages PDF document from ISTE (International Society for Technology in Education) which features the six major fluencies (standards) students need to develop in the 21st century classroom. Each of these fluencies is broken down into various skills all of which work in unison to cultivate the target fluency. From all the resources I have shared here on the 21st century teaching and learning, this document is by far the most comprehensive and practical. It touches on almost all the skills and competencies required to build an intellectually, socially, culturally, and digitally apt student. Here is a quick round-up of the six major fluencies included and you can access and download the the full document from this LINK. “Students use digital media and environments to communicate and work collaboratively, including at a distance, to support individual learning and contribute to the learning of others”.